The $245,000 Ghost, pictured, went on sale last year. BERLIN (Bloomberg) -- Rolls-Royce plans to expand the Ghost model line to help the ultraluxury nameplate double unit sales. 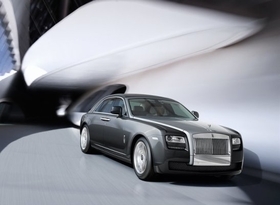 “I'm quite confident that we're going to see a Ghost derivative to come,” Rolls-Royce CEO Torsten Mueller-Oetvoes said in an interview at the carmaker's headquarters in Goodwood, England. “There's still a lot of potential in the market” for a less formal Rolls model. The $245,000 Ghost, which went on sale last year, is Rolls-Royce's second product line after the Phantom, which starts at $380,000. Even with its cheaper price tag, the smaller model, which is 5400mm (17.7 feet) in length, will boost operating profit, Mueller-Oetvoes said. The Ghost has spurred growth for the exclusive marque after the financial crisis depressed sales 17 percent in 2009. Rolls-Royce delivered 1,467 cars through August, already surpassing the record since BMW took over in 1998 of 1,212 cars sold in all of 2008. The company aims to sell at least 2,000 cars in 2010, after delivering 1,002 last year. Rolls-Royce's factory, which occupies a corner of the aristocratic estate that hosts the annual Festival of Speed motoring event, currently produces about 12 Ghosts a day and 3 Phantoms, spokesman Andrew Ball said. Rolls-Royce, which competes with Volkswagen AG's Bentley and Daimler AG's Maybach, is known for its hand-craftsmanship and what enthusiasts call a “magic carpet” ride because of the car's smooth on-the-road handling. Demand is improving for ultraluxury cars such as the $350,000 Maybach, shown. BMW bought the rights to Rolls-Royce cars for 45 million pounds ($70 million) in 1998 and re-launched the brand at a new factory in 2003. Production moved to Goodwood after Rolls-Royce Group Plc sold the Bentley brand and the Crewe factory, where both cars had been built, to VW, a deal that left BMW short of a production site for Rolls-Royce cars. Workers spend 17 days to make a typical Phantom, fitting 50 square meters (540 square feet) of leather onto the seats and consoles. Time is added for special items. For instance, one customer requested an embroidered eagle head on the headrests, which took 32 hours to perfect. “You can get machines to do this work, but it takes the soul out of the car,” said Timothy Harman, a manager in Rolls- Royce's leather shop, which employs about 130 people. While Phantom demand has yet to recover to pre-recession levels, more customers are adding their own features, such as a 15,000 euro ($19,600), four-person picnic hamper. The bespoke customization program won't be open for the Ghost until next year. Buyers have dreamt up options such as leather dog mats, diamond-encrusted emblems and wood veneer from a specific tree. Buoying demand for luxury cars, Wall Street firms are adding jobs for the first time in two years. Senior managers, excluding those whose pay is disclosed in company proxies, may get a 5 percent to 10 percent increase in bonuses this year, according to August estimates by compensation consultant Johnson Associates Inc.
Bentley lifted deliveries by 11 percent to 2,489 vehicles in the first half. Daimler aimed to sell more than 1,000 Maybachs a year when it reintroduced the 1930s-era marque in 2002. 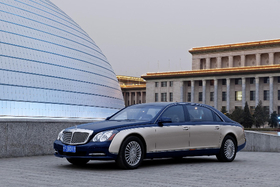 Sales topped out at 600 cars in 2003 and Daimler delivered 200 Maybach vehicles to customers last year. A Maybach starts at about $350,000 and its Zeppelin goes for more than $600,000. The financial crisis has added to demand for customization on Rolls-Royce interiors as the wealthy seek to make their consumption less conspicuous, Mueller-Oetvoes said. Items include a roof liner that simulates a starlit sky and embroidery on headrests. “We see quite a lot of bespoke in the interior of the car -- much more than in the past -- so something that is a bit more disguised and not perceivable by everybody looking at the cars,” said Mueller-Oetvoes, a 22-year BMW veteran who took over as Rolls-Royce CEO in April. Rolls-Royce CEO Mueller-Oetvoes wants customer feedback before deciding on Ghost derivatives. Mueller-Oetvoes was in charge of brand and product development for Mini between 2000 and 2003, overseeing the relaunch of the small car. 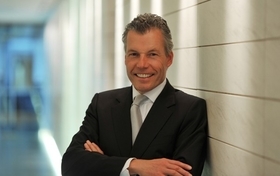 He headed marketing and branding for BMW from 2004 and took over global product management in 2008. The CEO said he is awaiting more feedback from customers before deciding on a timeframe and style for future Ghost derivatives. Much of Rolls-Royce's growth has come from China, which will surpass the UK this year as its second-largest market after the United States. Mueller-Oetvoes plans to selectively add dealers in China, India, the Middle East and the United States to further boost sales. Still, Rolls-Royce will remain exclusive. Mueller-Oetvoes said. “That's not the right strategy for us.